We try to be frugal in order to afford our life and attain our goals. At the same time we try to consume responsibly so that our choices have the least negative impact on our fellow humans and on our earth and its creatures. This was a heckuva week. Trying to get this website ready-to-publish at the same time as Len’s contract job as well as living our regular life. 1. At 5:00 one night we remembered we had to leave the house in 40 minutes to walk to a meeting. Instead of driving and buying fast-food along the way, sups was pasta, shredded cheese, microwaved peas, and some of the pesto Len made two weeks ago. This took less than 25 minutes from starting to finish and cost 20 minutes and a dollar. 2. Made a quadruple bath of laundry detergent. Took 15 minutes (including clean up), cost less than $5, will last 4-6 months, and is not toxic to anyone or anything. I use this “recipe” from The Prudent Homemaker. http://theprudenthomemaker.com/make/laundry-soap I use Fels Naptha soap which is good for removing oil, butter, dirt, and sweat - substances Len and I are talented at getting on our jeans and t-shirts. I cut the bar of soup into small pieces and then pulverize in our 37-year old Cuisinart. And then wash the Cuisinart pieces in the dishwasher. 3. We went to two evening things this week. Walked to both of them. 4. The only surprise trip out in the truck was this morning when Len got a flat on his bike and I drove out to get him. See above. A guy on a bike is seldom too far away. 5. 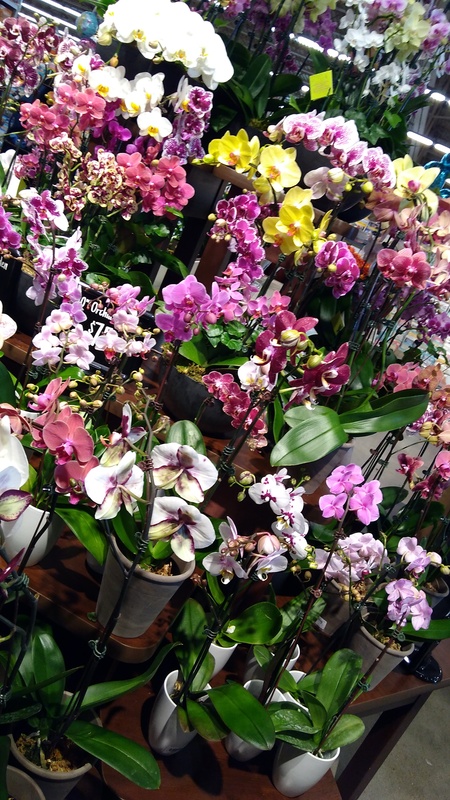 I walked around a corner at the grocery store into a huge display of magnificent orchids. Didn’t buy any. Did take pix and then text to a friend who I knew was working hard right then, just to bother her. Sharing flowers…. What did you do lately to be respectful to too-easily-exploited workers, to preserve the environment, to be mindful of animals – and yet to not break your bank?